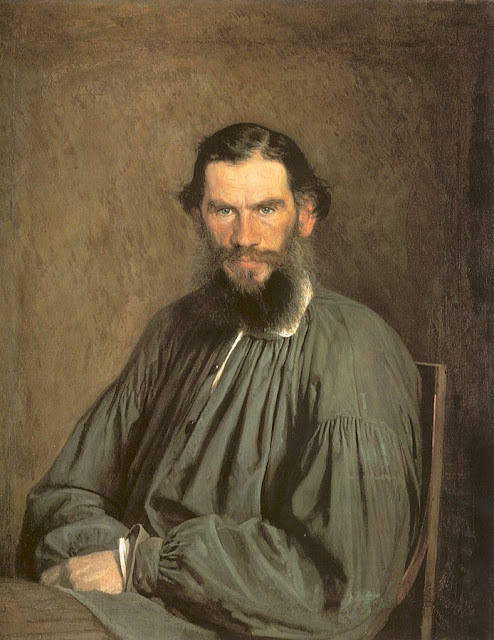 Tolstoy: The Greatest Writer of all Time? In the west, Tolstoy is generally rated as the greatest literary novelist: last July, Newsweek placed War and Peace at the top of its meta-list of 100 great novels. 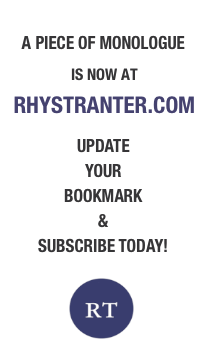 (Orwell's Nineteen Eighty-Four snuck in second, with Joyce's Ulysses third.) Critics hail the extraordinary psychology of Tolstoy's characters, and veterans say nobody has written better about battle. And the east, especially Japan, reveres Tolstoy's philosophy. "Across the whole world there is a huge Tolstoy boom. He's esteemed everywhere apart from here [in Russia]," Deryabin admits. Russia's scant regard is connected to its own troubled existential journey, Deryabin suggests, and its failure to discover a national idea. "We have been searching for it for long time. 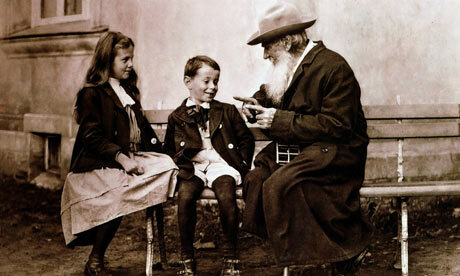 In fact, the answer is the one given by Tolstoy: the task before humanity is to be happy now." Deryabin concedes that, for most Russians, the previous century was pretty awful – in other words, more Dostoevskyan than Tolstoyan. "The last century, with its emphasis on darkness and suffering, was Dostoevsky's. Now I hope it's Tolstoy's turn," he says. The writer's great-great grandson, Vladimir Ilyich Tolstoy, agrees that Russia's painful 20th century had a distinctly Dostoevskyan tone. "I hope the 21st century is Tolstoyan," he says. Vladimir is the director of the state literary museum at Yasnaya Polyana. With his sweeping Tolstoyan forehead, he is instantly recognisable as a member of the distinguished Tolstoy clan. [There] is a vast shelf of books by Leo Tolstoy, and these contain some very intriguing and much less widely read works. It's not, as popularly thought, that Tolstoy abandoned writing fiction after Anna Karenina. The Death of Ivan Ilych is a late piece of writing, or relatively so, and it's as good as anything Tolstoy ever wrote: a vivid account of the dying process, as harrowing as anything I have ever read. He also wrote any number of wonderful late tales that read a bit like folktales, but they are self-assured, vital, unforgettable. I like especially a very late tale called "Alyosha Gorshak". And then, indeed, there is a fine historical novel, Hadji Murat – not a book easily bypassed by anyone seriously interested in Tolstoy's accomplishment as a writer. 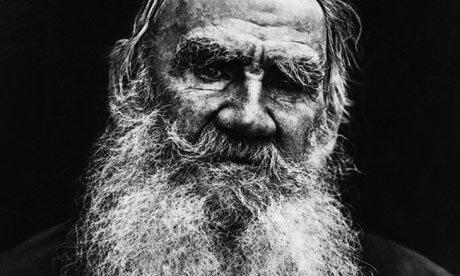 Tolstoy became a kind of prophet in his old age, during the last few decades. He turned to Christianity, but he did so with a twist. It was his Christianity. That is, he had a vision of Christ that did not include supernatural trappings. He learned New Testament Greek and spent a great deal of time rewriting the Gospels, taking out the miracles, all the supernatural bits. He saw Jesus as a great man who had a special relationship with God, and he spent decades elaborating this idea in essay after essay. The Kingdom of God Is Within You is a whole book that puts forward his ideas on Jesus, faith, God, pacifism, and the moral life. I myself collected bits and pieces from his last four decades in a new volume out from Penguin Classics called Last Steps: The Late Writings of Leo Tolstoy. JM Coetzee calls Tolstoy the exemplary master of authority, by which he means, I think, that he makes us trust what he tells us. This is all the more surprising since Tolstoy seems to speak freely, in his fiction, with the sort of moralistic-prophetic voice – the voice of a teacher of right and wrong – that lesser writers are obliged to use sparingly, unless they want to sound pompous and didactic. While that is distinctive and remarkable, it's not what makes Tolstoy a great writer. Nor is it his tight focus on the three essential themes in narrative art, namely love, death and money.